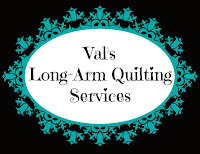 Val's Quilting Studio : A Perfect Sew Day Ahead! We kinda thought old man Winter forgot about us this year as we've only had one snow before today. And quite honestly, we have been absolutely okay with that after our "Snowmagddon" last year. Yet, as I sat and face-timed with my grand guys and daughter this morning and watched it begin to snow...that exhilaration that snow brings started to rev up its little motor. All's I could think of was: "Lucky me", I get to relax and spent the better part of my day right here, busily sewing to complete my February OMG...knowing I, of course, have some snow shoveling ahead me later today. (Which I don't mind) But without the distractions of wanting to be outside. Grateful am I to have the company of my faithful pup and a hobby I enjoy so very much on a such a Wintery day. How about you? What do you find yourself grateful for today? Looks like a perfect sewing day! We woke up to a couple of inches and I have been in my sewing room in my pajamas all morning. I need to get some snow gear on to go outside and get pictures of my OMG. Good luck on your OMG! Only a dusting when I woke up here but the max was about 34*f so it was a perfect sew day and I didn't even walk the dogs today either because I have a cold. But I finished a quilt top! See days rock!!! Oh fun, a perfect day to stay in and sew! Looks cold. We are having an unusual warm spell, it was in the 70s yesterday! Too warm for February, things are starting to open up, leaves and flowers are budding, and are now in danger if we get another freeze. Our last frost date is in May, and it has been known to snow here in April, so we are concerned. Well, for openers, that cute picture of Jackson waiting for his turn at the sewing machine. :-) It's rainy and gloomy here today and I'm glad I don't have to go anywhere. Finished a quilt yesterday so today will concentrate on making a block for my guild's quilt bingo quilt and making a pillow cover. Weather folks are hinting we could have some snow in March - not unheard of here in Maryland. Have you received more snow today? We are under a weather warning for deep snow and winds. Great time to quilt! And do laundry - we can double task, can't we? I love your quilty piles on the floor! I can't imagine that weather as we are currently sitting at 84 degrees which feels like 88. Ugh! Hope you accomplished all you wanted to in the sewing room. What am I grateful for today......many, many things, but a warm day with blue as blue sunny skies just about tops my list. =) Enjoy your sewing, lovely Val....oh and that blanket of snow! Aw, I see a puppy who's all ready to sew! After your snow-free winter, I bet your school kiddies are excited. Any chance of a snow day (sew day) tomorrow? Today I'm grateful that the rain on top of a snow melt has stopped. There are lots of flooded areas near us--the worst since a huge flood in 1975. Today is sunny and windy, so things are drying up. Yay! Ahhhhh, nothing better than quilting on a snowy day! A good snow day is a lot of fun. We haven't had one of those in a few years. Hope you got in lots of fun stitching.